You will need to install Winrar or 7Zip if you don't have one of them by now. You can download one of these from the links I have provided. Download a .mpet file. You can open any .mpet file no matter who owns it. You can download pets from here http://miniaturepets.net/resources/. I'm going to be using a pet I didn't make for an example, so you can see you can open any .mpet file. I am using the Doge pet, you can download it from here http://miniaturepets.net/resources/doge.29/. Once you have downloaded the file and moved it to where you would like it you can see if you try to open it, it will show this. Tick the "Always use this app to open .mpet files" so you can always open a .mpet with no hassles. 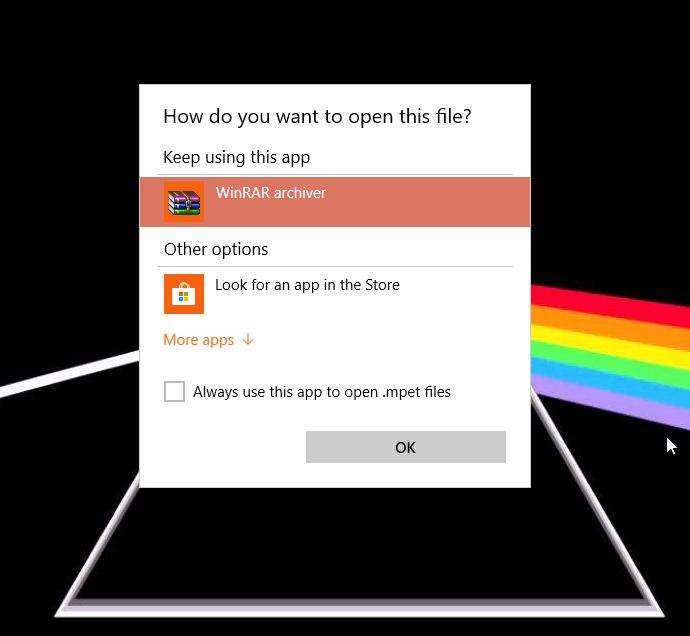 If you don't see this pop up right click the .mpet file and highlight over "Open with" and click on "Choose another program"
Now click on "More apps" and look for Winrar or 7Zip if you don't see it you will need to click on "Look for another app on this PC" and find WinRAR or 7zip that way. You are now done, the file should have opened or the icon should of to the same icon a .zip looks like. You can now double-click the .mpet file to open it.